Toss the scallops in the sesame oil and season. Preheat a griddle pan or grill lined with lightly oiled foil. Combine the lime juice, chilli sauce and coriander until well mixed. Griddle or grill the scallops for 2-3 minutes each side, in batches, until just cooked. 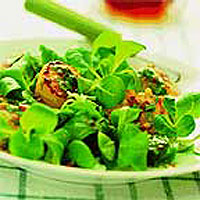 Pile lambs lettuce onto each plate and arrange the scallops on top. Spoon over the dressing and serve. Make this into a light supper that will serve 4 with a side dish of Thai fragrant rice. This recipe was first published in March 2003.